Robert Harvey. Sharing Common Ground: A Space For Ethics. New York: Bloomsbury, 2017. 304 pp. In the context of global capitalism and rising nationalisms, space is clearly a major issue. Economic crises and postcolonial wars are increasing the number of migrants, whose current treatment prefigures the ways in which we will deal with the incoming flow of climate refugees as the ecological crisis brings to light the material limits of our planet. Sharing space may be the ultimate challenge of our time. 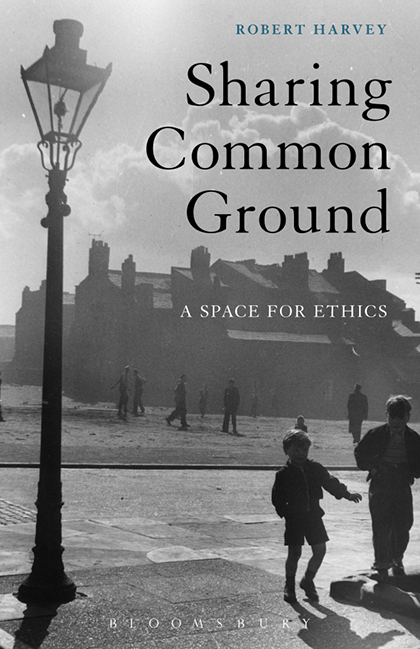 This is, in my view, the broader context from which Robert Harvey’s book Sharing Common Ground: A Space for Ethics draws its relevance and, more importantly, its urgency. Looking at “spaces otherwise” such as concentration camps, slums, and cemeteries, the book examines their ethical potentialities and offers a crucial addition to the emerging field of heterotopology. It argues that even though these spaces cleave us, leaving us with a sense of shock and terror in face of the unimaginable, they also create a sense of belonging that is ultimately a fertile ground for empathic experiences. The book is well documented and extremely comprehensive. It would be impossible to provide a summary, for it demonstrates a mastery and sure knowledge of a constellation of concepts taken from a wide range of figures including Giorgio Agamben, Georges Didi-Huberman, Marguerite Duras, and Immanuel Kant, among many others. As the reader will certainly be dazzled by this book, I will focus here on the broader picture, following the argumentative thread, which I will explore in reverse order before offering some possible lines of development. The problem for Harvey is not so much the conditions in which asylum seekers are received, or the theoretical meaning of hospitality as it was—for example—for Jacques Derrida, but rather the already existing ethical potentialities of liminal spaces such as construction sites, shanties, cemeteries, or camps. In fact, the book is a compelling response to Agamben’s claim that the Nazi camp has become the biopolitical paradigm of the West (chapter 4). According to Agamben, the camp embodies the archetype of a space of exception, called a zone of indistinction, in which the political status of subject of human beings has been suspended in order to expose anything but their ontological status of bare life. In other words, human beings have been excluded from political representation and jurisdiction but are nevertheless included in the management of life and affected by the violent consequences of politics. Harvey’s stated purpose in this book is to “shed a slightly different angle of light” (p. 185) on Agamben’s analysis and to provide a glimpse of hope for those spaces “in which innovative politics and ethics might still be thought and invented” (p. 147). Harvey’s strongest move is the return to Michel Foucault’s concept of heterotopia, from which Agamben coined his theory of the “zone of indistinction” (see chapter 3). The author provides a new translation of Foucault’s lecture title “Des espaces autres” as “Of Spaces Otherwise,” instead of “Of Other Spaces,” and offers a crucial corrective to its extensive and sometimes irrelevant diffusion in the humanities as mere spaces apart (pp. vii–viii). Harvey rightly stresses that Foucault, contrary to the standard, has placed the adjective “autre” after the noun and thus inflected its primary meaning. Heterotopias such as prisons or cemeteries are not only (and maybe not at all) spaces that are topographically apart, separated from the harmonious day-to-day unfolding of social life, but are also ontologically different. Indeed, I would call to mind the fact that, in his lecture, Foucault insists on the quite structuralist idea that space no longer takes the form of a homogenous and quantitative extension, but one of a heterogeneous and qualitative set of relations in which sites are defined by their position with regard to each other. Consequently, heterotopias are more in relation to than apart from all the other sites, even though they present the particularity of “suspend[ing], neutraliz[ing], or revers[ing] the set of relations that they happen to designate, mirror, or reflect” so much so that “they have a function in relation to all the space that remains.” It seems that Harvey is exploring one of these functions to situate his work within the discipline of “heterotopology” as imagined by Foucault. Following Foucault, Harvey argues then that the adjective otherwise “adds to apartness some sense of belonging . . . by which that which is apart is also a part of this, here” (p. 104). It is this curious property of being here and there that leads the author to locate new ethical potentialities in spaces otherwise. First, they “inflect my way of being, thinking, and judging from the way I carry out these functions of life in the spaces where I eat, sleep, play, work, dwell” (p. 102). In other words, spaces otherwise produce an ontologically changing experience in which one becomes otherwise to oneself. But most importantly, spaces otherwise overcome the division between here and there, us and them, me and you—building a contact area for empathic experiences and moral encounter. Spaces otherwise present the specificity of a division that always includes a sort of sharing, which Harvey designates under several names such as inclusive disjunction or the French word partage, carefully translated by him as “cleave” (see, for example, p. 54). Here, the author borrows again from Foucault and highlights the crucial yet unnoticed double function of the notion of partage in the philosopher’s work, tracing it back to Georges Bataille and René Char (chapter 5, chapter 6). Indeed, the idea of an inclusive disjunction runs through Foucault’s work from the great divides of modernity to the epistemic discontinuities of history: madness is separated from reason only to the extent that madness and reason are coconstitutive of each other. Here again, Harvey is offering an essential reading for those who study Foucault. For Harvey, the cleft between here and there of spaces otherwise is made possible through the aid of the imagination, “the only function of consciousness where ruptures and cleavages can appear to be (and thus become) opportunities for suture and sharing” (p. 168). He aims to demonstrate this through a reading of Kant’s analysis of the sublime which he interprets as an ethical—even political—ability to be affected (chapter 2), following Jean-François Lyotard (whom Harvey has translated and on whom he has written extensively) as well as Hannah Arendt. For him, the operation taking place when confronted with a space otherwise bears strong resemblance to the experience of the sublime, because their objects are similar. Both the wide ocean enraged by storms and the atrocities of death camps violently challenge the power of imagination to represent what exceeds understanding, leaving us in shock and terror. But both also provide fertile ground from which empathy can grow, as soon as the imagination recovers upon realizing that one is at a safe distance from the dreadful spectacle. The experience of the sublime then consists in taking pleasure in the discovery of one’s empathic capacity to put oneself in somebody else’s place. This may be where Harvey distances himself from the Kantian text and offers an alternative interpretation of the experience of the sublime. For Kant, the feeling of moral superiority at stake in the experience of the sublime lies in the triumph of reason that comes to rescue imagination from its failure to present the inconceivable and feels its supersensible power to overcome the limits of sensibility. For Harvey, it seems that quite the opposite is happening: he writes that “imagination intervenes to come to the rescue of reason shocked by what we see” (p. 76). I see two lines of thinking that may explain this discrepancy. First, the author is taking sides in an ongoing debate on the unimaginable and the ethics of representation, opposing thinkers like Susan Sontag or Claude Lanzmann to Ariella Azoulay or Didi-Huberman. Explicitly following the latter, Harvey considers it a moral obligation and a duty of memory to acknowledge representations of atrocities: “such images—however ‘unimaginable’ we may hypocritically deem them—must nevertheless be sustained by the imagination” (p. 113). It seems that Harvey’s argument mostly concerns images that are contemporary with the atrocities they depict. In this regard, he discusses the only four pictures taken inside Auschwitz, Georges Lacombe’s documentary La Zone (1928)—a narrow strip of wasteland surrounding Paris from 1840–1920, where the most precarious population took shelter—as well as Eugène Atget’s album of photographs Les Zoniers. But this reflection should be extended outside spatiotemporal coordinates since the very power of the imagination is to form representations of things not present in front of our eyes. Here, Harvey is drawing from his last book, Witnessness (2010), in which he contends that the state or potential of being a witness—thanks to the imagination—is the foundation of our ethics. Notwithstanding, Sharing Common Ground pushes the discussion further, underlining the necessity for this ethics to take place—in other words, to find actual ground on which to deploy its potentialities, whether this space is localized in the real world or in our imaginations. The stakes for Harvey are clearly the building of “a common ground,” a community or a “commonality” (p. 289) that emerges out of spaces otherwise, through the force of the imagination, that unites while at the same time respecting differences. Again, Harvey dissociates himself from a traditional romantic reading of the experience of the sublime. Instead of asserting the superiority of an individual subject—an I—over nature, he surmises that it consolidates a we. Here lies the second reason I would like to suggest as an explanation for the author’s distance from a pure Kantian interpretation. Most examples given by Kant to plumb the depths of the experience of the sublime are natural phenomena, whereas Harvey draws his analysis from historical, photographic, and literary spaces that involve human figures. Eventually, he grants photography the privilege of perceiving and revealing ethical potentialities on the basis that “the photographic apparatus can so much more often . . . stare back” (pp. 162–63). So, when looking at the Zone as a paradigm of space otherwise, he focuses on the lives and depictions of its inhabitants, especially the rag pickers. The author seems to draw here from a Levinasian conception of ethics as a physical encounter with the other’s face, but gives it a greater extension since this encounter might as well be only imaginary. One might think here of Azoulay’s Civil Contract of Photography (2008), wherein she argues that photography creates a civil space, irreducible to national boundaries, based on a tacit contract between photographed subjects and spectators who become responsible for what they witness. But the difference between the two thinkers is that Azoulay would argue that it is the photographed subject who stares back, while Harvey only writes that it is the photographic apparatus. I wonder here if Harvey is paving the way not only for “a post-genocide ethics” (p. vii) but also for a more challenging and ultimately more resonant theory of ethics that would explicitly accept nonhumans as sharing common ground. In other words, I wonder if his book might be the starting point for a post-Anthropocene ethics. Here, I understand the word “Anthropocene” not so much to mean the geological age characterized by the human’s influence on the planet, whether it began in 1610 or 1945, but rather a theoretical yet concrete event by which our ontological categories have been challenged, starting with the distinction between nature and culture. Bruno Latour has rightly posited that all the divides of modern society—discussed above—can be brought back to an original greater divide (“le Grand Partage”) between nature and culture that conditions all the other ones—the concept of nature being mobilized to exclude from the ethical and political realm lives that are supposed to be either too close to it (Native Americans, women, animals) or too far from it (criminals, homosexuals, mad people). With the Anthropocene, however, it is no longer possible to think humans as outside of nature, and we must think ourselves as part of collectives of beings dependent upon each other as we share the same earth. It is true that in her book Minimal Ethics for the Anthropocene, Joanna Zylinska addresses a nonanthropocentric reading of Levinas though a materialist lens. However, she mainly argues for more generous divisions (“cutting” in her terms) that allow her to embrace broader collectives, whereas Harvey is offering to bridge divisions thanks to the power of the imagination. Harvey’s contribution helps to reground ethics, in contrast with a tradition that thinks the subject as universal, transcendental, and dislocated, yet without falling into a reactionary theory according to which community is defined in territorial terms. Ultimately, he offers a space for ethics beyond national and—possibly—ontological frontiers. Thinking politics and ethics that unite while respecting differences is critical for the present moment. It is worth noting that in spite of their different theoretical frameworks, scholars such as Alain Badiou, Antonio Negri, and Christian Laval have in the last few years evinced a renewed interest in thinking the common as a political principle distinct from the communist tradition. Harvey’s book helps to formulate the question in more ethical terms. Finally, this privilege granted to the imagination allows the author to combine his theoretical and philosophical inquiry with the commentaries of more artistic pieces borrowed from literature and visual arts. The book opens with an entirely new translation of Duras’s short story, “Construction Sites,” which literally embodies a fulcrum for the author, who builds up, or extracts, his thought from this very ground (chapter 1). This methodology presents the advantage of experimenting with speculation with the help of works of art rather than simply interpreting them or using them as illustrations of theories. In this sense, it is very much in accordance with the postmodern idea that artistic experience—and a fortiori the experience of the sublime—is an encounter that forces us to think and to produce ideas. This is, incidentally, what Harvey argues about the discreet, almost silent, yet decisive influence of Char’s poems on Foucault’s philosophy. It would be tempting, then, to say that Duras is to Harvey what Char is to Foucault. Michel Foucault, “Of Other Spaces,” Diacritics 16 (Spring 1986): 22–27; translation revised. See Bruno Latour, “Comment redistribuer le Grand Partage?,” Revue de Synthèse 110 (Apr.–June 1983): 203–36. See Joanna Zylinska, Minimal Ethics for the Anthropocene (Ann Arbor, Mich., 2014).